The mother of a feudal lord's only heir is kidnapped away from her husband by the lord. The husband and his samurai father must decide whether to accept the unjust decision, or risk death to get her back. Seibei Iguchi: I am ashamed to say that over many years of hardship with two daughters, a sick wife and an aged mother, I have lost the desire to wield a sword. A serious fight, the killing of a man, requires animal ferocity and calm disregard for one's own life. I have neither of those within me now. Perhaps in a month... alone with the beasts in the hills I could get them back. But tomorrow, I am afraid, is completely impossible. 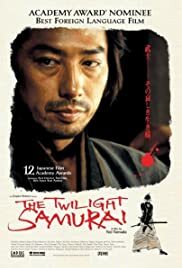 I approached director Yoji Yamada's period film anticipating the usual brew of flashing blades, unfathomable codes of honour and majestic arterial sprays but found instead a gently melancholic and beautifully played story of unspoken love and ethical struggle. Seibei (a mesmerising less-is-more turn from Hiroyuki Sanada) is a low-ranking widowed samurai with a senile mother and two daughters, working in the castle's stores and taking in piecework to get by. Grief at his wife's death has led him to turn his back on violence but he is confronted with it nonetheless, firstly as a result of the return of a childhood friend for whom he has strong feelings and who is fleeing her abusive marriage and, finally, when the politics of the day overtake his clan and he is ordered to carry out an assassination. Seibei's struggle is not for outward respect but to find integrity within a social order over which he has no influence, making the bursts of violence all the more jarring. Yamada's film is rightly compared to Kurosawa's work and its thoughtful, lyrical tone and themes resonate powerfully. 82 of 86 people found this review helpful. Was this review helpful to you?